When working with water pipes, especially older pipes or those exposed to the elements, it is not always a simple matter to unscrew two joined pieces. Rust forms a bond between two metal pipes that can seem stronger than glue when attempting to turn them. Unscrewing the pipes is possible if the rusted seal between them is broken before the attempt. There are a few techniques to accomplish this without resorting to contacting a plumber or handy man. Unscrewing rusted water pipes requires more than just physical strength. 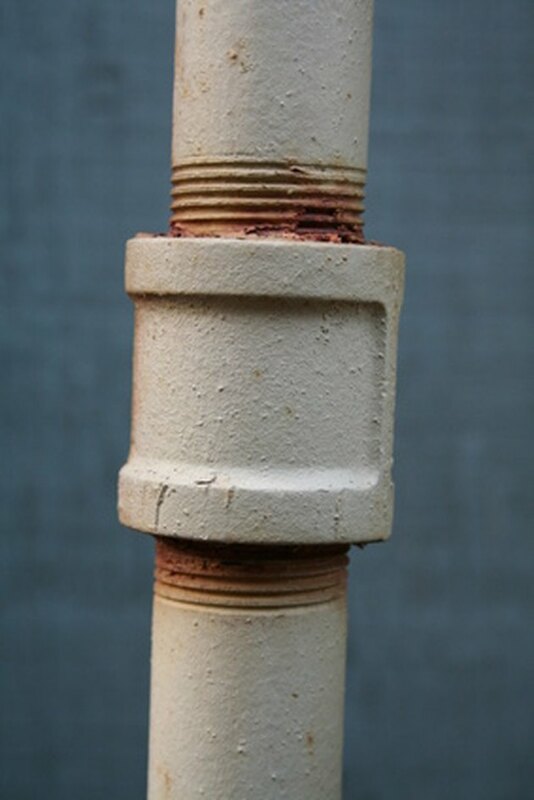 Clean the areas around the pipe connections with a wire brush or high-grit sandpaper to remove as much of the exterior rust around the joint as possible. Don't actually work at it so hard that you damage the pipe. The idea is simply to get to the bare metal, not to remove all the visible rust. Spray the joint of the two pipes with spray lubricant. Try to direct the spray around the seam in such a way that some of the lubricant is able to soak between the two pipes and allow it to work to break the rusted seal. For highly rusted and sealed pipes, leave the lubricant for 15 minutes before trying to unscrew the pipes. Add more lubricant if necessary. Wipe up any lubricant on the outside of the pipe with a clean cloth, and use a damp sponge to remove any surface remnants. Allow the pipe to dry completely, and then use a propane torch to heat the two connected pipes. Move the torch back and forth over the pipe for approximately one minute to help the metal expand slightly. Allow it to cool for another minute to break the rust seal between the pipes. Use an adjustable pipe wrench and carefully turn the wrench so as to not damage the metal. Do this before the pipe cools completely for the best results. If the pipe still refuses to break loose, repeat the lubrication and try again. Heat the pipe a second time if the spray is unsuccessful again.